As one has come to expect, The Hilton Arts Festival this year offered a wide and eclectic choice of productions to choose from. In fact, the programme appeared to be even more jam-packed and exciting than ever. As a result I found that the decision was more a case of what to leave out than what to see. 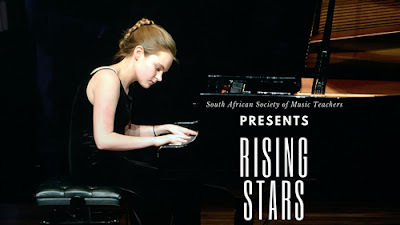 New at the festival was The South African Society of Music Teachers (SASMT) Rising Stars production. This concert, which is similar to the event which they present in collaboration with Friends of Music in Durban every year, is designed to showcase the talents of KZN’s best young classical music students. The event was held in the Campbell venue on the Hilton College campus. This new venue is pleasantly roomy and is laid out like a cabaret club with seating arranged around circular tables. The line-up for the concert included eight young ladies (no boys! – all one can say is get with the programme, guys!). All are students from schools in Pietermaritzburg and Durban. Given the opportunity to display their talent and skill all the young stars rose to the occasion and gave performances which were heart-warming, uplifting and exciting. At a showcase concert such as this it seems churlish to single out individuals but based on her shear ability and artistic integrity, mention must be made of 16-year old pianist. Rachel Wedderburn-Maxwell. Having deservedly won nearly every age group award available in the country, this young lady is showing the class which marks her as a future super star. Her interpretation of Enrique Granados’ Allegro and Concierto Op 46 was masterful. She showed a dazzling touch at the keyboard with plenty of power and wonderful sensitivity. Two other young performers who stood out were both from Wykeham Collegiate in Pietermaritzburg. They were Yasha Nair playing the flute and saxophonist Erin Muirhead. The rest of the programme was made up of Savannah Scoular (recorder), Chanel Bates (voice), Clarice Van Niekerk (clarinet), Mandy Pitchers and Laurie Aucamp (piano duo) and Leia Poona (violin). All highly talented and potential stars of the future.